Where do I use my OKA voucher code? Follow the link to OKA’s website. Make your selection of furniture and add your items to your basket. Proceed to checkout and paste your code into the ‘Do you have a promotion code?’ box and click ‘Apply Code’. Be sure to take a look in the Outlet section for big savings on a variety of home products before purchasing an item at full price. Frequent sales and special offers, as well as our OKA voucher codes, mean finding the addition you want needn’t be costly. Low-cost standard delivery is available for all products and should you change your mind about your new acquisitions, their 7-day policy means you’ll be able to return them at your convenience. Take a look at our OKA discount codes and deals for the best offers on chic interior design. Save up to 60% on a selection of end-of-line discontinued furniture and accessories in the outlet at OKA. Discover incredible discounts on a huge range of products, such as upholstered chairs, tables and a whole host of other smaller items for your home. In the outlet, you can find chests of drawers, decorative items, sofas and chairs, soft furnishings, storage and shelving as well as tables. Find a variety of colours and materials with prices ranging from just £25 to £2000 at OKA. The sample sale at OKA Direct lets you find plenty of discounted products for your home including sofas, tables and beds as well as accessories like lighting, soft furnishings and curtains. Find inspiration for your home with furniture and designs in collections like Parisian Chic, Barn Storming, All Things Bright and Beautiful, Feng Sue and Palazzo Nuovo and then buy the furniture from the Sale section to recreate your desired look at home. OKA are proud of the breadth and variety of their furniture collection. At the heart of all furniture at OKA is functionality as well as insistence on luxury materials, unique designs and old-fashioned craftsmanship which ensures that the resulting pieces are beautiful and useful, remaining so for many years to come. OKA’s furniture collection spans many different styles and eras - from traditional French dining chairs and classic English bookcases, to contemporary Japanese desks and minimalist Scandinavian storage - carefully curated to help you create a signature look for your home. Are all products online the same as in store? No, there are some products that are only available to buy in store, these are usually limited edition collections or end of line / ex display items. Likewise, there are often products found in the outlet section on line that can't be found in store. Will I be able to track delivery of my order? Yes, items are sent via Parcelforce and once your order is dispatched you will be sent a tracking number with your confirmation email. This can then be used to track your delivery on the Parcelforce website. Can old furniture be removed when new furniture is delived? This service is only available for deliveries within the M25, OKA can take away like for like old furniture, there will be a charge for this service should you choose to use it. Unfortunately if you live outside of the M25 then this service is not currently available. OKA is a multi-channel retailer of products for tailoring the interior of your house into your dream home. With our OKA promotional codes you’ll be able to save money on furniture, lighting, soft furnishings, tableware and storage products, all carefully selected from classic designs reworked for modern living. 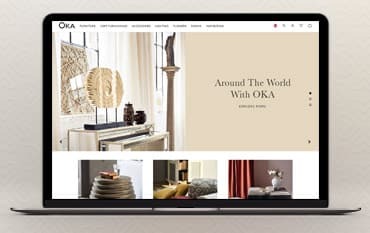 With over a decade of trading experience, OKA are keen to help you find the look you’re after, with many inspirational roomsets to stir your creativity and a professional interior design service including a consultation with one of their experts to help you find the perfect arrangement from their beautifully made Oka mirrors, rugs, cushions and more.Select your discount and copy the code.